Profit soars tenfold at Genzyme Corp.
Genzyme Corp. of Cambridge said profit jumped tenfold as sales increased for its medicines for rare genetic disorders, some of the world's costliest drugs. The company gained 3 percent in New York trading. Revenue climbed 19 percent to $960.2 million on the strength of its biggest product, Cerezyme, a treatment for Gaucher's disease, and its newest drug for hereditary disorders, Myozyme, for Pompe disease. Excluding costs, results beat analysts' estimates by 4 cents. Genzyme's drugs for rare hereditary disorders treat illnesses caused by a deficiency of certain enzymes needed for critical bodily functions. The medicines include Fabrazyme for Fabry disease and Aldurazyme for a genetic condition known as MPS1. Each drug costs an average $200,000 a year per patient, except Myozyme, which costs about $300,000. Akamai Technologies Inc. said third-quarter profit surged as demand increased for services to speed up delivery of online video and Web pages. The shares fell further in after-hours trading. Net income jumped 73 percent to $24.3 million, or 13 cents a share, from $14 million, or 8 cents, a year earlier, the Cambridge company said. Sales rose 45 percent to $161.2 million, in line with the average of 16 analysts' estimates in a Bloomberg survey. Affiliated Managers Group Inc., the US investment company that owns stakes in two dozen money managers, said third-quarter earnings rose 29 percent as fund deposits accelerated. Net income climbed to $42.6 million, or $1.07 a share, from $33.1 million, or 87 cents, a year earlier, the Beverly company said. The company increased earnings for the 17th straight quarter as assets advanced 3.8 percent in the period to $276.8 billion. The company has averaged two acquisitions a year since its 1997 initial public offering. It agreed yesterday to buy most of Cooke & Bieler Inc., a Philadelphia fund manager. Boston Properties Inc., the biggest US office real estate investment trust, said third-quarter earnings more than doubled on higher income from building sales. Amgen Inc. reported sharply lower third-quarter profit on plunging sales of its most important anemia drugs, amid new insurance coverage restrictions and safety concerns and on restructuring charges. But the world's largest biotech company by sales exceeded Wall Street's diminished expectations for the quarter. Amgen posted net income of $201 million, or 18 cents per share, down from a profit of $1.1 billion, or 94 cents per share, a year earlier. Excluding stock option expense and other costs, Amgen earned $1.08 per share, topping analysts' average expectations by 5 cents per share, according to Reuters Estimates. Worldwide sales of Aranesp decreased 23 percent to $818 million in the third quarter as US sales of the anemia drug that boosts red blood cells in chemotherapy and kidney patients plunged to $460 million from $720 million a year ago. Total revenue of $3.6 billion was flat from a year ago but slightly better than Wall Street estimates of $3.58 billion. Boeing Co., the world's second-biggest commercial airplane maker, said quarterly earnings rose a greater-than-estimated 61 percent on surging orders from Asia and the Middle East. Sales for next year will be below an earlier forecast, causing the shares to fall. A six-month delay in delivering the new 787 Dreamliner prompted Boeing to cut next year's projected shipments by up to 40 planes, or 7.7 percent. 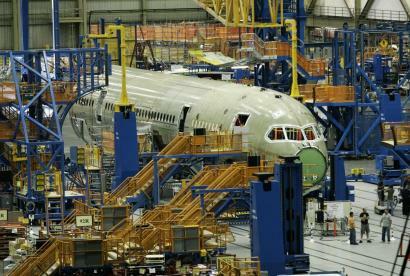 The 2008 profit outlook is unchanged, Chicago's Boeing said. Boeing delivered 9 percent more commercial aircraft in the third quarter than a year earlier, putting it closer to eclipsing Airbus SAS as the biggest plane maker. Net income rose to $1.11 billion, or $1.44 a share, from $694 million, or 89 cents, a year earlier. Profit topped analysts' average estimate of $1.26 a share. Boeing raised its full-year sales and earnings forecasts. Monster Worldwide Inc., parent of jobs website Monster.com, reported a quarterly profit versus a year-ago loss, and raised its stock buyback by $100 million. Monster posted net income of $33.3 million, or 25 cents per share, in the third quarter, compared with a net loss of $83.8 million, or 64 cents per share, a year earlier. The New York Times Co., owner of The Boston Globe, has an alliance with Monster Worldwide to sell help-wanted advertising.